Caroline Crommelin and Florence Goring Thomas: 19thc Interior Decorators: Who Were They? Caroline Anna de Cherois Crommelin (c 1854-1910) was born in Co Down, Ireland, one of the many children of Samuel de la Cherois Crommelin of Carrowdore Castle. Although of gentle birth, the family had little money. Political unrest in Ulster forced a move to England and after their father’s death in 1885 Caroline Crommelin and her sisters found it necessary to work to support themselves. Caroline’s elder sister, May, became a novelist and enjoyed a measure of popular success. In 1903 another sister, Constance, married John Masefield (who was very much her junior). In 1886 another of the sisters, Florence, married a solicitor, Rhys Goring Thomas, and in the late 1880s with Caroline, who seems to have been the driving force, embarked on a career as a ‘lady decorator’. The pair were able to travel easily along the path blazed for them a decade earlier by Rhoda and Agnes Garrett. Unlike the Garretts, Caroline and Florence do not appear to have had any specific training, although years later Caroline wrote that an apprenticeship was essential. Rather, they relied on what was assumed to be a natural taste absorbed from their early surroundings. In a later interview Caroline described how their father had given the two of them a room in Carrowdore Castle to do with as they wished and from painting and papering this room they had learned their trade. Whereas Rhoda and Agnes Garrett were happy to deal with drains and internal structures, I doubt that such practicalities fell within the Crommelin sisters’ remit. It was ‘beautifying’ that was the word most often used to describe Caroline Crommelin’s work. An article by Mary Frances Billington in The Woman’s World, 1890, describes how in 1888 Caroline Crommelin set up a depot at 12 Buckingham Palace Road for the ‘sale of distressed Irish ladies’ work’ and then ‘saw a wider market as a house-decorator, so she wrote ‘Art at Home’ on her door-plate, took into partnership her sister, Mrs Goring Thomas..and boldly set forth to hunt for old oak, rare Chippendale, beautiful Sheraton and Louis Seize furniture’. She attended auctions in all parts of the country and, in case there was any doubt as to the propriety of this involvement with trade, reported that she had no difficulty doing business with dealers, meeting only with civility. Noting the popularity of old, carved oak, the sisters’ bought old plain oak pieces and then had them carved by their own craftsmen. There was always a stock of such pieces in their showroom. The ‘Arts at Home Premises’ were opened in Victoria Street, London, in early 1891. I think their house was at 167a Victoria Street – certainly by 1898 this was Caroline Crommelin’s work premises, but it’s possible that in the late 1880s she was working from 143 Victoria Street. Of the ‘Arts at Home’ premises The Sheffield Telegraph (9 March 1891) described how’charmingly arranged rooms, stored with delightful old oak, Sheraton, and Chippendale furniture, quaint brass ornaments, old silver, beautiful tapestries, and old china were crowded all afternoon with the many friends of the clever hostesses.’..The oak room featured a delightful ‘cosy corner’ in dark oak with blue china arranged on the top ledge against the pink walls. May Billington’s article includes a line-drawing of a corner of the ‘Arts at Home’ showroom. One of Caroline Crommelin’s first ‘beautifying’ commissions was carried out for Lord and Lady Dufferin on the British Embassy in Rome in 1890/1891. The Manchester Guardian (8 Oct 1889) reported that she redecorated the entire embassy. Doubtless this plum commission was not unconnected to the fact that the Dufferin estate in Co Down was a mere 10 miles from Carrowdore Castle; the families were presumably known to each other. 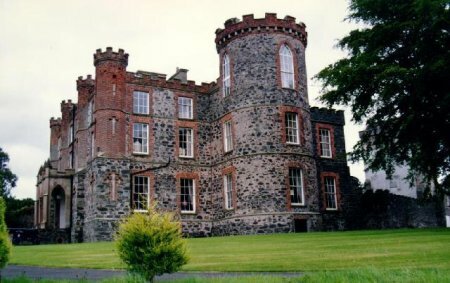 Rather more surprising is the claim made in an interview with her in the Women’s Penny Paper, 23 Nov 1889, that she had ‘supplied nearly all the furniture to Lord Cholmondeley’s old place at Houton [sic]. Houghton Hall was let to tenants during the 19th century so, perhaps, there is a kernel of truth buried in this statement – but I don’t think we need go looking at Houghton as it is today for evidence of Caroline Crommelin’s involvement in its decoration. 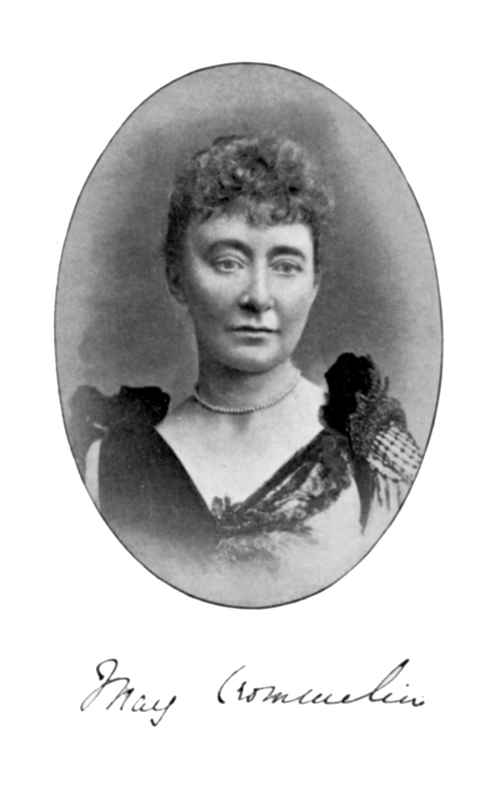 In interviews Caroline Crommelin also made clear that she ‘undertakes, when required, to furnish a whole or any part of a house, either going with the customer to different firms or selecting for them’ and ‘does not confine herself to decorative work alone, and will put up blinds or attend to the whitewashing of a ceiling with the most professional alacrity’. Both Caroline and Florence were supporters of the campaign to give the vote to women householders and were keen to see women’s advancements in the professions – particularly as architects. In 1895 Caroline Crommelin married Robert Barton Shaw, nephew of a former Recorder of Dublin, who in the 1901 census return is described as an estate agent. I wonder if his wife helped in ‘beautifying’ houses he had for sale? In 1901 they were living at 50 Morpeth Mansions, Morpeth Terrace. Caroline in this census return is described as an ’employer’. Florence lived close by -in 1891 at 3 Morpeth Terrace. However hers was to be a short-lived career – she died in 1895, aged only 37, a few months before her sister’s marriage. In the 1889 Penny Paper interview Florence was quoted as saying ‘I believe everybody is happier for working. It carries one into a new life, and one does not have time to think of being ill’. In the light of her early death this has a certain poignancy, suggesting she may have had a chronic illness to overcome. Caroline Crommelin (or, rather, Mrs Barton Shaw) died at 18 Albion Place, Ramsgate on 1 February 1910. This entry was posted on May 26, 2015, 11:52 am and is filed under The Garretts and their Circle, Uncategorized. You can follow any responses to this entry through RSS 2.0. You can leave a response, or trackback from your own site. Exciting to find this. We are just working on May Crommelin for an entry in Orlando (orlando.cambridge.org/). She dedicated her novel The Luck of the Lowland Laddie, 1900, to Caroline, but her Dust before the Wind, 1894, features exquisite decor as the opening characteristic of a female sceptic who later goes right off the rails. However, her nonconformist taste is exotic, not historical-British!